2013 Emory College graduate Evan Mah is the food editor for Atlanta Magazine. For some, food is life; and not just any type of food, but good food. 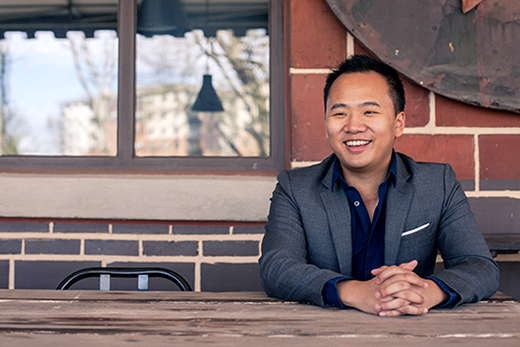 Emory Alumni Association's EmoryWire caught up with alumnus and food editor of Atlanta Magazine, Evan Mah 13C, to get a taste of his culinary delights and where best to find them. 1. What are the elements of a delicious meal? I’m going to go off-script and suggest a more exacting question like “What does it take to be a great restaurant?” This is particularly relevant since Atlanta Magazine will be naming the 50 best restaurants in January. It’s easy to eat well—a cheeseburger at Bocado or even just a bucket of fries from Leon’s Full Service does the soul good—but creating a great restaurant is much more complicated. First, we consider the price range and the restaurant’s ambition. Are they trying to be 5-star fine dining or a casual neighborhood hangout? That sets the bar for service standards, quality of ingredients, execution, and creativity. Consistency, too, matters a great deal, and the best restaurants fire on all cylinders every night of the week (no small task). We also consider what the restaurant brings to the area. Are they giving us something we’ve never seen before (like Gunshow)? Are they reviving a style of dining that we didn’t know we missed (like Little Bacch)? Some people think that if they’re paying $125 for dinner, the food better blow their mind. That’s an unfair expectation, and it’s important to remember that at a certain price point, dinner is about the experience. Food should be great, no doubt about that, but expert hospitality and comfort offer a type of luxury and sensation that a lobe of foie gras can’t. 2. What has been the craziest dish you have ever eaten? Summer 2011 I studied abroad in China, and, at the end of the trip, I met-up with a professor in her hometown of Chengdu in the Sichuan province. This region is known for hot pot, a dish that involves cooking raw ingredients in a broth bubbling the middle of the table. Eel, mushrooms, thin slivers of beef—that was all fine. Then the server plopped down a plate of one perfectly intact whole brain (of what animal, I cannot say). They didn’t even try to mask what it was, and I imagine the kitchen just pulled out the brain, quickly ran it under water, and then sent it out. The taste, from what I remember, was metallic, similar to bad sweetbreads (the thymus gland). 3. If you had to choose one food to eat for the rest of your life, what would it be? It’s hard to say, since some of my first instincts—cheese puffs, pigs-in-a-blanket, pasta—would likely lead to diabetes or a terrible case of gout. I’m sticking with the nigiri at Tomo. I’m a sushi snob, and Tomohiro Naito is the only guy who can make rice that makes me question what I’ve been eating all my life (and I’m Chinese). It’s just warm enough and unbelievably textured and savory. And in the event I have to pick one wine to uncork for the rest of my life, it’s the 2006 Etienne-Sauzet Montrachet. I could eat and drink this stuff behind bars and still be the happiest guy on the planet.